﻿ Innsbruck, tour, interesting city within the alps, Inn valley. Innsbruck is the main city of the region called Tyrol in Austria. It is the 5th biggest city in Austria and has a big university with over 30.000 students. The city is located in the Inn valley (that goes from the Arlberg area toward Germany / Bavaria). Innsbruck is surrounded by mountains and has in north the Nordkette, part of the Karwendel mountains and in the south the line central mountains with the Patscherkofel mountain. It is therefore also seen a one of the most interesting alpine towns as it is surrounded by mountains that can be as beautiful as imagined on clear days and as threatening as possible during cloudy days. The city of Innsbruck is in the valley at an altitude of 1.880 ft. above sea level and is surrounded by mountains that are over 7.800ft. above sea level. Therefore it is considered to be in the heart of the alps. In the south the Brenner pass is one of the most important passes in the alps where already roman troops and others traveled over to get to the area north of the alps. Through the Inn valley most people traveled then on to the area of Rosenheim, where the valley opens then to more smooth hills to the north, east and west. there is also a pass towards the north but historically not as much used. Nowadays if you come by train to Innsbruck from Munich or Italy, you will either go through the inn valley, or over the Brenner pass to get to Innsbruck. Also an airport has been opened in Innsbruck but only with a special training pilots are allowed to land due to the thermal winds that happen some few times at this airport. 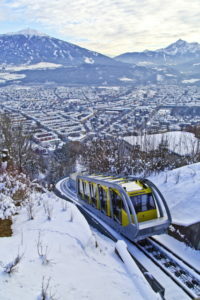 The city of Innsbruck is nowadays popular among all people that are interested in winter sports. Innsbruck was also for two times location of the winter olympic games and holds within the city area every year the world cup of ski jumping. A very thrilling event. In the summer time people come to this attractive city to experience the mountains very close by and to reach up to the mountains by cable car, funicular, car and hiking. Another attraction is definitely to see also the mountain zoo of Innsbruck were rare animals of the alps are shown. Innsbruck also brings you back in time with many attractions and historically buildings that show you the importance of Innsbruck in former times. One of the most important building in the town is the city’s landmark: The golden roof. The first settlements in Innsbruck go back to 3.000 years ago when settlements were found around the center of Innsbruck. The romans arrived at about 15 before christ to make there a military station against invaders. It was only destroyed then in the 7th century. The main church of Tirol was located at Brixen in South Tyrol which used to be part of Tyrol until the first World war when the southern part of Tyrol (including most parts of the Dolomites) became Italy and the area of Tyrol was separated. Innsbruck itself has the first proofed settlement at the beginning of the 12th century when also the first bridge over the Inn River was established in Innsbruck, therefore also the name of the bridge over the Inn. Since the 13th century the city right has been given to Innsbruck and soon the connection to the Habsburg family was given. This meant for the city a very strategically position since everybody that passed over the Brenner from Italy, or that needed to go to Italy had to pass the bridge at Innsbruck and tolls were the biggest income for the city. Therefore already in the 15th century the golden roof has been constructed to show also the richness of the city. This meant also that in the 16th century the biggest military base in Austria has been established to prevent foreign armies to invade the area. Also by that time the beginning of the postal system has been established together with the family Tassis from Italy to send letter and announces into the Habsburg empire by horse riders and knights. Members of the family Tassis married then into the german house of Thurn and became then the inventors of the postal system as we know it nowadays. Since the 19th century the railway through the Inn valley is operating and connect Woergl, Kufstein, Innsbruck with Germany and since the end of the 19th century also over the Brenner pass and the Arlberg mountain to Switzerland. The 20th century leaded to drastically changes in Innsbruck: After the first world war Tyrol was divided in North tyrol, South Tyrol and led to a lot of people that fled from south tyrol to Innsbruck where they found new places to stay. After the second world war Innsbruck was under the rule of the Americans that helped to rebuild the city, the university and the airport. Already in 1948 the first helicopter for search and rescue was placed in Innsbruck and it is until nowadays the most important station of these helicopters within the alps. 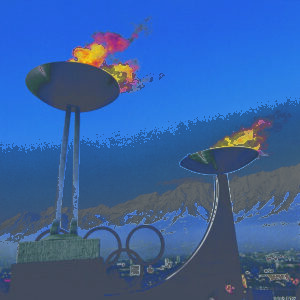 In 1964 and 1976 Innsbruck was the place where the olympic winter games have taken place. Still nowadays some stadiums and locations can be found, even if adapted to nowadays times. The winter sport plays still the most important role in the area. Skiing areas are very close by and all famous skiing or snowboard brands are sold in the locations. Another very famous company in this area is Swarovski in the nearby Wattens where also a museum can give more inside about the factory, history and products. Innsbruck is famous for its touristically area being directly in the middle of Northern tyrol with all famous ski resorts within the area. Innsbruck is the center of the trading in the area and on the main road to get from north to south in Europe. One of the biggest industry in Innsbruck has been the production of Loden (made of thick, water-resistant woolen material with a short pile). Nowadays the production is still going on but not any more so important as it used to be. Besides that the city of Innsbruck hosts many hospitals, university students and international tourists. Tourism is the biggest income for the city and lots of efforts are done to keep everything clean, safe and nice so that many more tourists come to this region. The importance that Innsbruck used to have is shown in all the beautiful buildings in the city and also by the summer residences of the Habsburg family, like castle of Ambras, the Hofburg of Innsbruck, the golden roof, an the castle of Hungerburg (getting there by funicular). Visitable at any time is also the skiing jump that holds the world cup within the city and the alpine zoo in the north of Innsbruck which hosts one of the finest collection of alpine animals within the alps and which is the highest zoo (at about 2.250 ft. above sea level) in Europe. Each year lots of sportive events take place in the winter time in Innsbruck, such as the world cup for ski jumping, the air & Style contest, a snowboard jump contest and the world cup of sledging in the ice track of Innsbruck. Innsbruck is nowadays not only the heritage of it’s own history but also is a town directly within the heart of the alps. You can see that mountains and sports are so close and still it is on the main traffic route between north and south and from Switzerland to the eastern part of Austria. It is to show how impressive mountains are and can be combined so perfectly with a city in the middle of the Inn valley, where you can explore the history of the winter olympic games and other mountain sports. But do not miss out to visit the city not only in the heart of the old town but also from one of the surrounding mountains, like the Berg Isl, the Hungerburg funicular, or the Norkettenbahn. Visit Innsbruck and learn a lot of this city – history and fascinating stories of traditions, mountains and nature – b(e)specialtours! If you want to enjoy some great time in Innsbruck, book a private tour to Innsbruck with B(e)special Tours from Salzburg, or arrive directly in Munich, enjoy a city tour with our comfortable vans, enjoy a guided tour through the town of Innsbruck and continue a nice drive through Germany and Austria. So if you are planning to come to Innsbruck, or if you want to Visit the city of Innsbruck and the Inn river valley and the alp’s mountains coming from Salzburg then please do not miss a nice ride with b(e)special tours! It is fun for youngsters and the older ones and you can taste a lot of delicious typical Austrian dishes a! Enjoy the fascinating city of Innsbruck – Innsbruck and history – with fresh ideas, food and a lots of fun – b(e)specialtours!